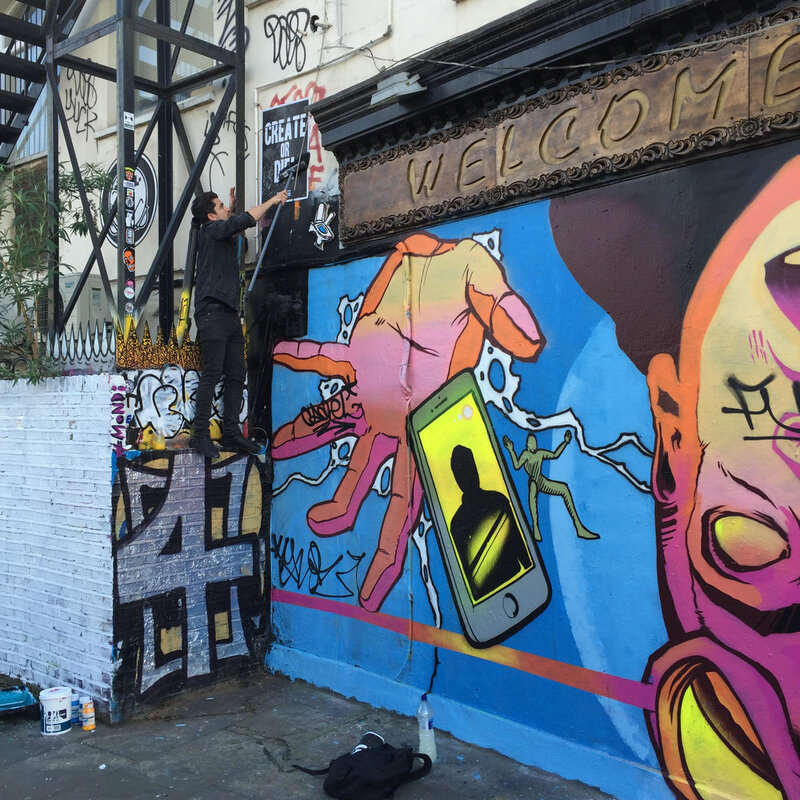 Earlier this week we had the pleasure of joining Parisian artist Thirsty Bstrd (Julien Surdeau) as he hit the streets of London spreading his global message: CREATE OR DIE! It helps if a street artist can be agile. While some viewers of the paste-up posters may see the phrase as provocative or alarming, it is a powerful message that has connected and resonated with audiences across the globe. Having placed works in the streets of Miami during Art Basel, then New York and Madrid earlier this year, the opportunity to broaden the exposure of the "Create or Die!" message in the sunny UK capital couldn't go amiss! "I love London, particularly this area (Shoreditch and Brick Lane). It's full of fantastic energy, fun, life and culture. You can walk through the streets and see people creating art on the walls and expressing themselves freely," says Julien. The 'Create or Die!' motif is a way of expressing a way of life for Julien and it should be no surprise how connected it is to his artistic name, Thirsty Bstrd. He yearns to voice himself through his artworks and like all artists pushing to establish their concepts he is thirsty for progress and momentum in all manners of life. It is this passion that has enabled him to showcase his artworks from Singapore to cheery Camberley via California. Despite being a gallery owner that specialises in urban art, I've never actually been on a genuine "street art" excursion before. Experiencing the rush and thrill of placing posters up in broad daylight amongst crowds of camera snapping tourists, passers by and restaurant owners while additionally walking around with a broom and 2litre bottle of mixed wheat-paste as a van full of police slowly drives past is definitely one of the most fun activities around! Thirsty Bstrd spreading the message. The incredibly agile Thirsty Bstrd managed to place a healthy amount of works throughout the streets with not all locations shown here in our article, so get out there, find them and share your pictures with us: have fun! After a few hours of hoisting our gallery featured artist into precarious locations, it was our time to fully experience the thrill with Julien handing us the honor of pasting up on a special site... under the famous Shepard Fairey and Invader mural wall. It was great to share a day with Thirsty Bstrd and further understand his process and work as we launch the gallery exhibition 'The Spraycan Strikes Back!' which is on display throughout April. Further information on our Thirsty Bstrd exhibition can be found here. This month we're offering you the opportunity to purchase a selection of iconic artworks from the sensational British mixed-media artist JJ Adams. Having worked with Rolls-Royce and Bang & Olufsen in 2015, this year we will witness the much anticipated American debut in Miami at Art Basel. This event is one of the most prestigious and largest in the art world and we're positive this will expose JJ to a wider market and new collector base seeking his earlier artworks.